This was my first time working with figs. I've avoided them over the years because my experience with them consisted of fig newtons and a fig perel sauce The Stallion bought a few years back, both of which I find potent and, well, disgusting. But lately I've been drawn to figs. They are so beautiful and have a certain allure to them. Having not ever held an actual fig before, I couldn't quite wrap my head around how they're eaten with the rind and all. I was intrigued. I had to get my hands on some of these puppies. If only because they photograph so beautifully. You can imagine my delirium when I found that they're currently in-season. It was fate! Pure fate. 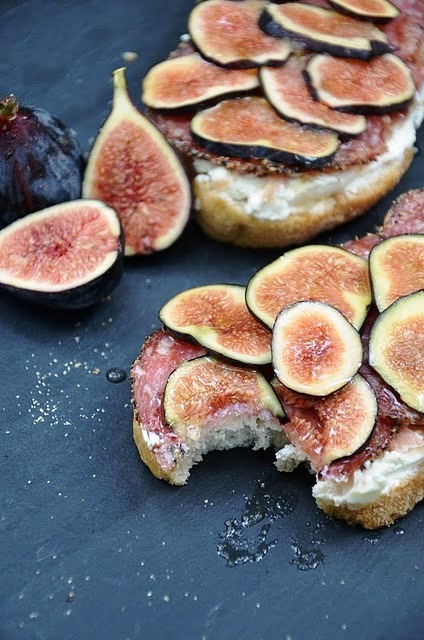 Fresh figs are nothing like fig newtons. The flavor is extremely delicate and just slightly sweet, a perfect addition to these salty, savory sandwiches. These could be easily sized down using skinny baguette slices instead for a great party appetizer - I'm pretty sure that will be my next book club contribution! 1. Add mustard to goat cheese and mix thoroughly. 2. Spread about 2 tablespoons of the dijon goat cheese onto each slice of bread. 3. 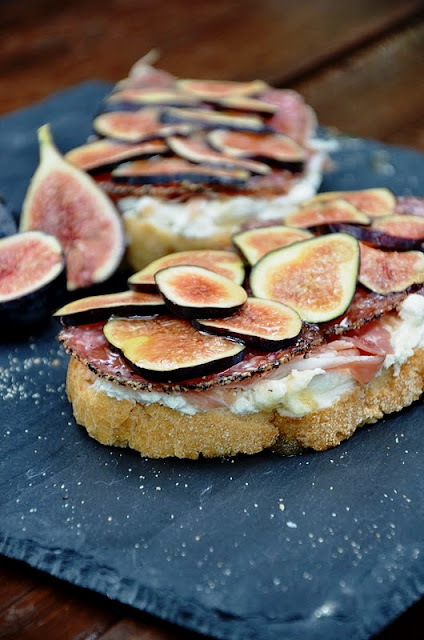 Layer bread slices with prosciutto, salami, Pecorino, then figs. 4. Drizzle with honey and serve. Note: You can use any combination of Italian meats and cheeses you wish. If you're in Kansas City, the best place to find these obscure items is at Bella Napoli in Brookside - they import all of their cured meats and cheeses straight from Italy. Now I'm going to need to stick them in my belly. All of the figs. In my belly. All of them. Ever. I love the smell of figs but I admit that I have never eaten one. These look perfect and they sound so delicious. GREAT. Now I have to scour my tiny little town for fresh figs.